Quentin Tarantino has long maintained that his success as a writer and director stems in large part from his encyclopedic knowledge of film and an adolescence spent absorbing as many frames of it as he possibly could. But Tarantino was also an avid consumer of television. While he was editing 1994’s Pulp Fiction, he would come home, collapse on his sofa, and watch The X-Files and Home Improvement. When he was hoping to cast John Travolta in 1996’s vampire drama From Dusk Till Dawn, he invited the actor over to his house and played the Welcome Back, Kotter board game with him. Travolta ultimately ended up in Pulp Fiction; George Clooney, who had broken his losing streak of canceled TV shows in the fall of 1994 with NBC’s hospital drama ER, wound up taking a role alongside Tarantino in From Dusk Till Dawn (which Tarantino wrote and Robert Rodriguez directed). That’s when the actor proposed that Tarantino consider directing an episode of the hit series. 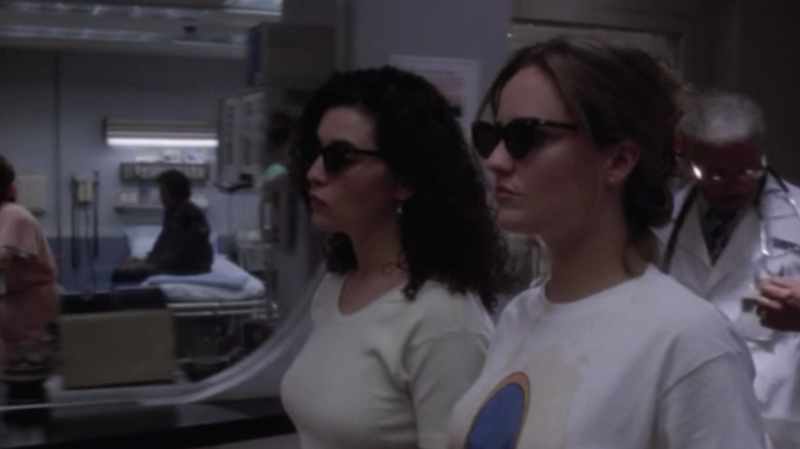 “Motherhood,” the penultimate episode of ER’s first season, aired on May 11, 1995. Written by Lydia Woodward, the show’s intertwined plots were all related to the title’s theme and given a copious amount of screen blood to mesh with Tarantino’s reputation for unsettling imagery. A boy is wheeled in after a playground mishap with a rod poking through his chest (it’s removed, slowly, with help from a bone saw); a gang member’s ear is lopped off; a drug overdose leads to foaming at the mouth. Woodward says she didn’t really write the episode with Tarantino in mind, though she did try to “gross out” the medical procedures. Tarantino received $30,000 for the assignment, which probably seemed like a bargain to NBC. Just two months earlier, he was awarded the Oscar for Best Original Screenplay alongside Pulp Fiction co-writer Roger Avary. Woodward later told a reporter that Tarantino was interested in directing more episodes and possibly even appearing as a recurring character. That didn’t come to pass, though Tarantino did direct "Grave Danger," a two-part episode of CSI, for CBS in 2005. Headed into another awards season with The Hateful Eight, Tarantino hasn’t ruled out returning to the small screen. At last summer's San Diego Comic-Con, he told the crowd that he might have a few miniseries ideas that could come to fruition before he retires.